“It’s just a flesh wound.” Perhaps the funniest quote from the Black Knight in Monty Python and the Holy Grail. Fittingly, this beer says “I’m only a Dark Ale” and yet it is much more than that to us. From its epic appearance to the aroma and palate, we’re completely won over by the detonation of this malt bomb. Perhaps in need of a bit of refinement, this Black Knight is still packed with flavor and easy to knock back. Deep copper amber bodied call's itself a Dark Yorkshire Ale, this is a novelty beer this time featuring the Black Knight from Monty Python's Search for the Holy Grail. Head sticks around in my 1/2 liter mug floating above the edge of the glass forming a dimpled doughnut clouded tan foam appearance, lacing is even and intricately spread. Aroma has a touch of earthiness with mild tea leaf qualities, a touch of dark fruit with a roasted toasty nut character. Flavor wise it's got bitter herbal leaves and earthy dirt qualities with a mild roasted nut and even fruity malt character. Mineral water like feel to it, really doesn't wow me a pretty boring English roasted malt brown ale. In line with everything made by the Black Sheep brewery. Mouthfeel has a dry bitter finish from the East Kent Goldings, and a malt/hop profile that clashes a good bit with each sip, medium bodied with a harsh finish. I would pass but it was worth a shot considering how much I love the movie. Pours a clear red with brown throughout. Small, short-lived head drops to a faint ring. No lace. Smell is weakish with a weird vinegary note to accompany the witch-tempered malts, caramel, light smoke and molasses. Taste is the same with much less of the vinegar note and more smoke, molasses and roasted-over-witches malts. Better balance for certain. Not bitter but a tanginess is present. Medium bodied at best with a noticeable carbonation. Smoke lingers with the roast from the malt, fading gently. A decent brew but not worth a concerted effort to locate. With the cartoonish and somewhat comic marketing campaign, no one should under mind the beer inside, because doing so is a missed opportunity for any appreciator of English Pale Ales and Brown Ales. This Brown Ale is certainly knighted with a masculine and gentlemanly pour of solid brown with bronze highlights, and bright clarity. As the foam stance of ivory foam builds, it recedes from a rocky head to a thick blanket while coating the glass with sheets upon sheets of lace. Beer's simply don't look better. The rich aroma of fruits and nuts abound even with the more solid overtones of chocolate, toast, and toffee. A fruity-nutty mix of dates, apples, figs, cashews all weave into the malty focus, and with an almost woody hop character lurking beyond. The malty focus dictates the flavor spread but does so with a complex and varying combination of flavors that include the toffee, toast, slightly scorched caramel, peanut brittle, bread crust, and freshly kilned barley kernels. But it's the rich estery taste of apples, peaches, dates, figs, and marmalade that set this Brown Ale apart. Balanced only with the medium hop additions of earthy grass and wood bitterness, this keeps the beer balanced but doesn't draw undue attention away from the complex maltiness. Although the malty-rich taste exists, the body prefers and creamy malt character that evades the sweeter tone than the taste suggests. Instead the medium-sweet beer allows for the medium-textured body to endure through the middle palate but then falling off quickly afterward and then providing a minty and woody semi-malt dryness that closes the beer. Though I might prefer a slightly more toasty dominance that may promote more nutty character rather than the sweeter and fruitier example we have here, I recognize that this Northern English Brown Ale favors a complex fruity and malty variation that both excites the palate and is comfortably inviting at the same time. A: Dark brown body, white thin head. N: Rich malt with earthy hop contributions. T: Smooth with rich dark maltiness. Earthy English hops and a slightly astringent finish. M: Slick, astringent, a little tart. O: Decent English ale. Dark maltiness was a bit much for me on this one. A - Poured out a clear, cola brown color with a one-finger, tan head of foam. The head slowly receded to leave touches of lace. S - It smelled nutty and malty with a grassy nose. T - Nice nutty flavor with a sweet caramel backbone. It had a lightly spiced hop bite. M - It was crisp, sharp and smooth. A light to medium bodied ale with a dry finish. O - This is a nice English Brown Ale. Pored into a straight pint glass, as befits a British beer. A. Dark brown with a good one-finger light tan head that eventually thins down, but leaves some good lace. S. Sweet, medium roasted malts. Quite grainy. T. Not as sweet as the aroma hinted at. Lots of roasted, nutty malt flavours and a decent hop bite at the back. M. Medium bodied, smoothly carbonated. O. There are sweet English brown ales which have almost turned me off the style completely, but this is definitely not one of those. If you're looking for a good example of a dry English brown ale you couldn't go far wrong with this. I think they've nailed the style pretty well. Not every beer has to fire off skyrockets when you drink it. Sometimes, a simple thing done well is enough. A-Pours caramel brown with an inch of dense, tight khaki head. Leaves an intricate web of sticky lace. S-Caramel malt, soft tropical fruit sweetness, East Kent Goldings. T/M-Medium bodied, but it gets thinner mid-palate. The finish is dry, with tannic, mouth coating hops. Considering how light they went on the body/malt profile, this is a little heavy on the hop dryness.Not very interesting. This is very good, a fuller and more characterful ale than the regular Holy Grail, which is itself good (at least the version actually brewed in England; I had one brewed under contract apparently that was bland and simple). Dark brown, a bit reddish, it has a big tan head slowly shrinking to puffy, rocky head, a little lace. Aroma is dark toasted barley, caramelised toast, hints of wood and tea and nutshells, some winy prune. It's not super complex, but it's well-rounded, full bodied and very nice. Taste is winy dark fruit and wood, strong toast, some tea, subtle but firm bitterness and light sweetness, very balanced and well-integrated, with a very English character overall, and very enjoyable. This one starts off as a beauty and maintains it, for the most part. The head, a light tannish color, is a thick, creamy, pillowy crown sitting over two fingers high on the medium-brown, red-hued brew. It maintains itself pretty well, eventually falling to a foam. Thick, creamy lacing is left at the top of the glass, followed by some lighter patching the rest of the way down. The smell is potent, pouring out of the bottle as it's opened. This beer varies from boring, run-of-the-mill varieties, and is the most interesting English brown I can remember. What I find most distinguishing is a strong raisin/date/fig aspect coming alongside an otherwise nutty and earthy malt backbone and with a touch more earthiness and a little grassiness. It's even got a bit of a woody aspect and some smokiness from the roasting that's very light and complements the overall character well. The aroma, while strong, doesn't give as much variance as the flavor, where more of the complexities play out. The body is a sturdy medium with plenty of depth and texture to it. A nipping crispness remains constant alongside a bit of creaminess that remains likewise constant. 500 ml bottle served in a snifter. This Brown Ale pours a clear mahogany with a mostly short-lived tan head that manages to leave decent, spotty lacing. The rich aroma is very appealing and promising, wit ample notes of dark fruits, toffee and roasted nuts. Hints of apples and woody hops. Taste: neither what I expected from the nose, nor quite as appealing. The flavor is more malty with a darker roast and some burnt notes I did not smell, and the toffee mostly turns to caramel. Bittersweet, with the bitterness dominating almost from the outset and leaving what I though was a slightly too bitter aftertaste. Those other aromas do appear and include burnt toffee, toast, caramel, apples, a touch of smoke, dates and other vague dark fruits. There are some earthy hop flavors in addition to the bitterness. M: medium+ body; slightly astringent; medium-low carbonation. O: Despite the comic marketing on the label, this is a serious and complex beer that's well worth seeking out if you like English style Brown Ales. Pours reddish brown with a decent off-white head. No lace. Some rich malt and dark fruit in the nose. Fruit, wood, malt, some dark cherry, dates, brown bread, and a little bread crust bitterness. Medium bodied with decent carbonation. Ok brew. Some flaws, but pretty drinkable. 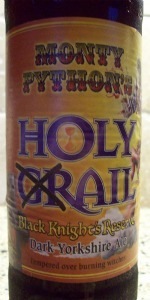 Presentation: 500ml brown pop top with cool Monty Python label. Despite what this says, I have a (very) strong feeling that this is Riggwelter (one of my all-time favorite beers, though nearly impossible to get in good condition Stateside) rebranded. Same abv%, same Maris Otter base, Pale Chocolate signature malt and 'strong Goldings finish'. Add to that the fact that this beer, while brewed at Black Sheep in Masham, isn't listed anywhere on their UK website, and, well, I stand pretty firm in my conviction. Let's see what kind of condition it's in. No best-by date, into my Riggwelter imperial pint. Appearance: An attractive walnut beer, with surprisingly high levels of streaming carbonation and gorgeous lacing. Though bottled versions typically run a bit frothier than cask versions, I don't remember Riggy being quite this lively. Bright clarity, and a lusciously creamy light tan head that shows amazing retention. Interesting sidenote: I thought Riggy used to be bottle conditioned, but there's no film of yeast left in the bottle, nor in the glass. Perhaps I'm misremembering, or something's been changed for the US market? Though a bit over-carbed for my taste, this is GORGEOUS beer. Smell: Just a hint of banana (that Black Sheep notes is present in Riggy) and some vinous fruit, along with earthy, yeasty notes, a hint of toasty caramel, and a touch of malt and cocoa powder. Really nice, though I'd like just a touch more malt character. Taste: Nicer on the palate, as the pale chocolate malt and toasty Maris Otter come through first and foremost, supported by vinous notes and a ghostly hint of apple. Ends hoppy bitter and medium-roasty. The flavors are nice, though I'd like just a bit more intensity here. Perhaps with a fresh sample? Overall: Again, I'm pretty damned sure this is Riggwelter and, to top it off, this is the freshest example I've had in a LONG time. I hadn't had a worthy example of Riggy in years; this reminds me how damn fine this beer can really be. At $5.00 a pint, this is a bit expensive, but solid as all hell. Poured from a small "bomber" or half-liter bottle into a standard pint glass. Clear amber in color, with a huge head of off-white foam. Taste-Toasted malt, milk chocolate, faintly nutty. Rather dry finish. A bit thin-bodied but flavorfull. Had to get the cool Grail Cups, so the bottles come with them. Nice brown ale, a bit firmer on the malts than the usual brown ale to me. Much more strength coming from fruity flavors like dates, figs and sweet at first but finishes bitter. Interesting beer, not going to be a favorite because it does have a funky aroma that a lot of English beers have in this style. Love the cup, glad to have it. Now who wants to drink the other bottle? Poured into a Black Raven pint glass. Pours a dark reddish brown with a half finger of very light tan head that dissipates quickly into a thin film and ring around the glass, leaving light lacing. Aroma dominated by sweet and roasted malt with a hint of nuts and hops. Flavor is similar, dominated by light toasted and caramel malt, finishing abruptly with a sharp hop finish that is dry and a bit astringent. The initial flavor is great for a moderate ABV brown ale, but the finish is not complementary. Light to medium bodied. A satisfactory brown ale and not too bad considering that it's a tongue in cheek presentation. 16.9 oz bottle poured into a Pils glass. Clear mahogany with 2 fingers of loose tan head. Moderate carbonation. Brown sugar, caramel, prune, raisin, and cocoa. Brown sugar, light caramel, and earth. Raisin and prune with dash of cocoa powder. Medium-light bodied, crisp, clean, and refreshing with a light bitterness. Crisp, clean, refreshing, tempered over burning witches. Pours a clear crimson-brown with a foamy bone head that settles to a partial film on top of the beer. Small swaths of lace form around the glass on the drink down. Smell is of toasted malt, caramel, and char-like aromas. Taste is much the same with toast and char flavors on the finish. A metallic flavor emerges as the beer warms up. There is a mild amount of roasty bitterness on the palate with each sip. This beer has a good level of carbonation with a crisp mouthfeel. Overall, this is an average beer that is fairly drinkable but a bit too metallic and one dimensional in the roast presence.